Bold MFG's Kindred Table Base Series allows you to easily configure your own custom steel table base to use with any table top you'd like. This table base system is perfect for breathing new life into that old table top that you love with those regrettably dated legs or for designing the perfectly sized piece from scratch. Just choose the leg design, base dimensions and fastening hardware and we build your custom table base tailored to perfectly fit into any space in your house. The Coffee Table is 15.5" tall and works perfectly with 1.25"-2" thick tops. All the table parts have a clear seal finish on them to highlight the natural color and variations in the steel. The finish is suitable for indoor only. This listing is for the table base only - you will need your own wooden top. --------------> Here's how to configure your table: 1) The overall length and width is custom tailored to your specifications. Our Coffee table legs can be made up to 72" in length and 60" in width". We recommend the base to be made 2" to 3" smaller than the overall size of your table top. This produces a nice overhang that compliments the design. 2) Select your preferred bolt style from the drop down menu. 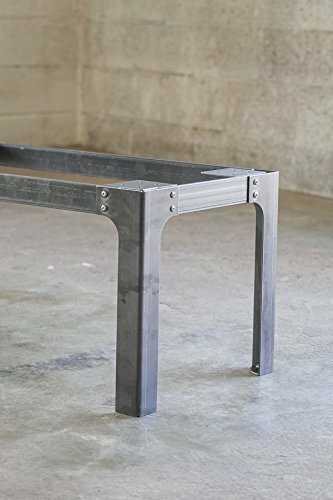 YOUR ORDER WILL INCLUDE: 1) qty 4, coffee table legs, industrial style in 10 Ga (.1345") steel; 2) qty 4, 3/8" x 2" horizontal members custom made to meet the length and width you specify; 3) qty 4, corner brackets w/ holes to attached to your wooden top; 4) qty 16, customer specified bolts, washers, nuts; 5) qty 8, wood screws to mount your wood top.